If you’re planning on rowing 3,300 miles across the North Atlantic Ocean in a 24-foot boat during hurricane season, you can imagine how important a reliable weather forecast would be. Cynthia Way, a chief learning officer at NOAA, is not just going to imagine making this journey; she’s going to do it. This week, she’ll set out from Cape Cod, Massachusetts, to Ireland with her boyfriend, James Caple, a software engineer. The journey will take three to four months, depending on weather and other obstacles they may encounter. If they make it across, they’ll be the first American pair to succeed in the endeavor. “We want to challenge ourselves to do something amazing, something that is also scary and way out of our comfort zones and will stretch our capabilities,” Way says. And stretch their capabilities is certainly what they’ll be doing. The two will face the grueling physical challenge of constant rowing, sleep deprivation, and mental exhaustion. Way is pursuing a Ph.D., researching how immersion outdoor experiences help people reconnect with nature and is hoping this journey will give her an up-close perspective she’ll be able to utilize in her doctoral research. 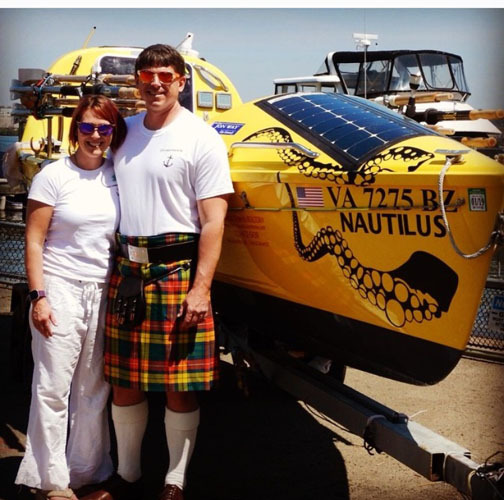 For his part, Caple has been planning and preparing for this trip since he read a news article about Roz Savage, a solo ocean rower, who in 2007 rowed across the Indian Ocean. Last year, the couple got in touch with Savage, who has been advising them on safety. “It is a dream come true to have Roz as our expedition mentor after stalking her all these years,” says Caple. While the challenges will be numerous, what Way fears most is the possibility of encountering bad weather. They’ll be provided with forecasts from a private weather service through satellite phones every three days. Weather reports are crucial to planning. Rowing shifts may need to be altered based on inclement weather. If there will be minimal sun, Way and Caple need to cautiously manage their use of power, as all their power is generated by solar. Also, the couple needs to be alerted to upcoming weather forecasts for preparation in case of a hurricane and challenging winds or waves. However, even if they’re alerted to rough weather ahead it will be difficult to change course far enough to avoid it. When they do encounter rough weather—which is likely given the majority of their trip falls smack dab in the middle of hurricane season—the plan is to hunker down. Way and Caple will tie down everything aboard and employ a para-anchor, an underwater parachute that creates drag to stabilize the boat, then wait out the storm in the cabin. The boat is designed to roll back up if flipped over. But what if they’re faced with a hurricane? Way and Caple say that staying with the boat is the safest option for both them and any potential rescuers. When faced with severe weather, they will deploy the para-anchor, alert their shore team manager, and seatbelt themselves in the stern cabin. If in life-threatening trouble, they’ll be able to activate a distress signal from radio beacons on their life vests, which would be picked up by a satellite and then transmitted to search and rescue authorities. You can track the team’s progress on their website and blog, 1000Leagues.com, which they will update by satellite.